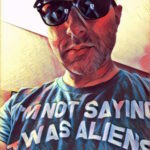 There is so much misinformation about the Roswell Incident that all the bogus stories about it need to be set straight. Let’s tackle those first, and then tell the real story of the most famous UFO crash in history. Denying skeptics and government officials love to make up stories about the Roswell Incident. You’ve probably heard at least some of them, so let’s clear them up before we move on to what eyewitnesses and evidence actually say. This was the original cover story invented by General Roger Ramey, who flew immediately to Roswell when news of a downed “flying saucer” hit the newspapers and radio. Ramey had some foil and balsa wood gathered and later forced one of the military officers who had been at the scene to pose with it. If it was just a weather balloon, why did the military feel the need to race into action the way it did? This is one of the latest official explanations by the US government: the wreckage found near Roswell was really a top-secret surveillance balloon for Project Mogul, which was supposed to detect the sound waves generated by Soviet nuclear test explosions. The Mogul balloons weren’t very different from a weather balloon, and would have been easy to identify—rather than causing a rabid series of national security actions as the crash did. Since then, they’ve also tried to say that the wreckage and bodies found were from high-altitude parachute experiments that used full-sized manikins—so that must be what people remember as a downed craft and alien bodies. One problem: those high-altitude parachute experiments happened in the 1950s, and weren’t going on in 1947. Oops. This is part of the cover story invented by the military on the same day that the crash was publicized: it was nothing but a weather balloon. The man who first found the wreckage, after spending a few days of “private time” with military intelligence officers, changed his story and started talking about foil and balsa. Today, that’s some of the nonsense you’ll still find on Wikipedia. The excellent (and disturbing) documentary Mirage Men is about government operatives who intentionally spread false UFO stories to muddy the water and make people look crazy. In it, someone suggests that the most successful operative, Richard Doty, invented the whole Roswell story himself. The problem with that idea: Roswell, the real event, existed long before Doty got his hands on the story. You can find Mirage Men on Amazon Prime Streaming. It had been a stormy day in Roswell on July 4, 1947. At about 11:30 PM, multiple witnesses saw a bright object that appeared to crash. Among them: Catholic nuns Mother Superior Mary Bernadette and Sister Capistrano, who saw a brilliant white light zoom down; they recorded the event in a log book. Meanwhile, Corporal E.L. Pyles, on duty at a military base south of Roswell, saw a strange light move across the sky and then suddenly head straight down. Off a remote road north of town, two lovers, James Ragsdale and Trudy Truelove (yes, her real name), saw the brilliant light hit the earth, and assumed they’d just seen an airplane crash. Radar technicans at the White Sands Proving Ground, about 100 miles away from Roswell, had already been tracking a strange object in the skies for a couple of days. 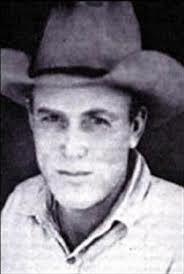 William Brazel, known by everyone as “Mack”, was the foreman of the Foster Ranch, located in a remote area northwest of Roswell. On July 6, Brazel appeared at the county sheriff’s office in town—Brazel almost never went to Roswell—with pieces of wreckage he’d found on the ranch the day before. The sheriff didn’t know what to make of it, and thought that the guys at the Roswell Army Air Field nearby might know what it was. They didn’t. Major Jesse Marcel, an intelligence officer, looked at the pieces and didn’t know what to make of them. Later, he and Captain Sheridan Cavitt drove all the way out to the ranch to inspect the crash site. There they found a large amount of strange, foil-like material that could not be cut or scratched, and when bent or folded, would return to its previous shape by itself. They also found stick-like I-beams, light but strong; some of the pieces had what resembled hieroglyphs on them. Marcel used a geiger counter on the wreckage; none of it was radioactive. Whatever had powered the craft was not nuclear. The men had no idea what to think, except what seemed obvious to all of them: that it probably was not manmade. The men loaded a truck with as much of the material as they could fit, and headed back to Roswell. The United States military had just announced to the public that they had discovered a crashed UFO. The media worldwide went crazy with the story, naturally, and phones in Roswell started ringing. General Roger Ramey appeared almost immediately and ordered everything to stop—the talk, the examination, all disc-related activity. It was just a weather balloon, and that’s what they were going to tell the world. Meanwhile, the real wreckage was loaded on a plane headed for Fort Worth Army Air Field in Texas for further investigation. “Gen. Ramey Empties Roswell Saucer”, read the headline in the Roswell Daily Record. It was clear to all those involved that this was a coverup. 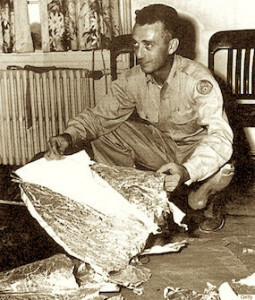 In a photograph with Marcel and the “weather balloon”, Ramey is shown holding a piece of paper; modern examination of it shows it to be a memo about the crash mentioning its “victims”. Weather balloon crashes do not generally have victims. Mack Brazel spent time with military personnel, apparently against his will. When he emerged, his story had changed, and he said he was sorry he’d ever mentioned it. He’d only found some foil and balsa wood, but he thought maybe he’d cash in on it by calling it a flying saucer. Oh, and he’d found it back in June. Yeah. That’s the ticket. June. Military brass told Marcel and his comrades to keep their mouths shut, and they obeyed orders. For years. In the early 1980s, Marcel finally started talking about what had happened—not to media, just to friends. Eventually, the information about what had happened in 1947 made its way to UFO researchers. Marcel’s son, who had seen some pieces of the wreckage as a boy, confirmed Marcel’s story. Soon, other witnesses were found, and the story unfolded. It became a legend. In the early 1990s, at the behest of the public and of President Bill Clinton, the Air Force began an “investigation” of the Roswell Incident. Not long after, they issued a report with a simple answer: it had been a secret spy balloon, part of Project Mogul. That’s all. When pressed about the victims, whose unearthly bodies were seen by witnesses, the Air Force produced another tale: the bodies were really just crash dummies, manikins being used in Project High Dive. As we’ve already mentioned, Project High Dive didn’t start until the 1950s. According to the Air Force, well, people get confused and stuff. Right? The amount of eyewitness testimony and evidence about the Roswell Incident could fill a book—and it’s filled several. If you’re interested in this case, we recommend checking out the movie Roswell, which stars Kyle MacLachlan and Martin Sheen. It’s a well-made dramatization of the events surrounding the crash. In books, we like Witness to Roswell by Thomas Carey and Donald Schmitt, as well as Crash at Corona by Don Berliner and Stanton Friedman. One more that’s worth your time: The Day After Roswell, a book by a former Pentagon official who was an eyewitness to and participated in the Roswell coverup. The book was written not long before the author passed away, so it’s a bit like a deathbed confession.